The concept of personality refers to the qualities of a person that together add up to what is called a character. The ability or difficulty of a character - or a lack of for that matter - to stick to principles is the main determinant concerning the concept of personality. The trouble of a personality weak in his or her principles is characterized by an internal conflict over the oppositions or dualities of the world. The ego that is culturally adapted but strayed away from the natural principle of an integer self awareness, is ever fearful being caught in between the social, individual, material and ideational fires of the opposites of the societal duality. That duality seems to offer an impossible choice which reminds one of the inability of a free voter to make a definite choice for this or that political party. In that focus of uncertainty flowers the neurosis of an ineffective personality individually and collectively. Every pole of each of the societal oppositites represents some kind of, or combination of, essential civil virtues (see also election groups). The virtue of a personality is characterized by a definite choice of being integer with the human principles and values, with the artistic and analytical creative expression characteristic for the human being, with spiritual transcendence, with the personal identity and with the individual and societal reality of the fields of action. 1 - Introversion versus extraversion - one is outgoing of initiative and enjoying the benefit of doubt or one is not or less so. 2 - Emotional stability versus emotional instability - one is troubled or not by bouts in which emotions dominate that defeat one's reasonable functioning. 3 - Conventionality versus openness - one is attached or not so attached to conventions in a closed hermetic mind that is not open to outside influences. 4 - Preciseness versus sloppiness - one is neat and tidy to the point of a compulsory neurosis or else is one more or less chaotic and indifferent to the other extreme point of a psychosis. 5 - Friendliness versus unfriendliness - one is social, forthcoming and adaptive without being a cheating sociopath, or one is selfish, and unsympathetic without being a manipulative control freaking psychopath. The problem with the psychological approach is in the inability of applying human values to these 'Big Five' dimensions. Valuing in behavioral science is considered unscientific in an agnostic, socratic approach which is considered to be precondition for the healthy open-minded attitude that, without judging people, is needed by the practical psychologist in order to work with clients in a therapeutic setting. Thus it is difficult to arrive at a comprehension that would describe a personality that would be healthy. Heath in the sense of having a certain character may be called integration though, the ability of a person to combine different visions and qualities in one coherent mindset. The degree of integration determines the quality of a personality, the degree to which a person is self-realized, matured, emancipated or developed. Deriving filognostically from the concept of integration in this respect leads to a certain valuing and comprehension in relation to the concept of emancipation or self realization. The filognostic view of the personality is one that values integration before that what is corruption to a person or a mistaken notion of means and ends at the one hand, and infatuation or a misalignment in respect of setting one's life goal and striving or working for a certain purpose of vision at the other hand. The failure to be integer one may call materialism or the neglect of the spiritual practice, principles and values, The purpose of filognosy is to rise above the fundamental duality of the material world and thus have a better grip on one's life. 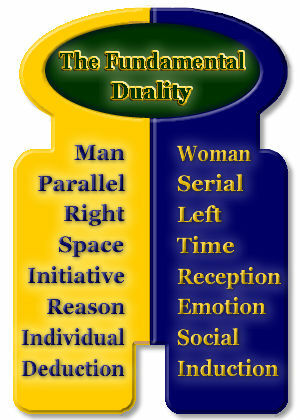 It is not to be specifically male or female, to be of the lateral serial left or parallel right function of the brain, not to be right or left wing minded politically, not to separate the interests of time and space as standard time does, not to be caught in a receptive or an exclusively outgoing mode, not to be in conflict with ones feeling and thoughts, not to fight against the group mind nor against the individual freedom and not to reason for the majority, nor to derive an elite. The position of not being caught in the dual opposition of the world thus described is the secret of personal happiness and self-realization. A poorly integrated personality will be more miserable in the materialistic fray than an integrated personality in his spirtual unification. The integrated personality will cherish a sound idealism of progress at the one hand, combined with a human interest in traditions and societal certainties at the other. The integrated personality is characterized by naturalness and equipoise in being balanced with the fields and the virtues. The purpose of filognosy is to become extraverted. Extraversion is the essential quality of the personality. The frontal region of the brain is its seat and is its dysfunctioning is associated with personality conflicts of duality. These conflicts may lead to personality disorders in the pathological sphere like schizophrenia and neurosis, the absense or disturbance of frontal brain activity. Introversion is good for one's meditation, but an explicit respect and a balanced life with the civil virtues and the fields of action require a certain outgoing initiative which defeats a positive societal valuing of the introverted personality. Introversion is part of the meditation excercise, but must be counterbalanced with outgoing activities in order to be able to speak of a healthy, filognostic integration and emancipation of the personality. In the science of yoga is to arrive at the transcendental position considered the only way for being emotionally stable and not illusioned.This is filognostically integrated with a healthy policy concerning emotions in general. The advanced filognostic has settled his emotionality by song and mantra meditation. Thus he has control over them in a regular habit of relating to the ideal position of transcendence. The active practice of a certain emotionality in a regulated manner - or ceremonial sense even - is the channel for expressing and controlling the emotions. In relating to the filognostic ideal there are several moods or mellows describing the emotional states one may experience in progressing towards a better integration. One may be 1) neutral, 2) servile, 3) sympathetic, 5) parental and 6) amourous at the sunny side of one's self-realization and durable service to the example of a personified ideal. But one may also at the less stable position of one's downside be 1) ambitious, 2) humerous, 2) jealous, 3) angry, 4) terrified, 5) disgusted and 6) bewildered or amazed. These all are considered healthy emotions of an emancipated person who usually has one or more preferred states in these as a basic character trait. Vedically it defines the so-called svarûpa, the original nature of service of a personality. Realization of the svarûpa is the original purpose of self-realization. While attachment filognostically is held as a hindrance in self-realization is at the other hand faithfulness to traditions a core value. Without a certain respect for the past it will be difficult to have a future since the future usually consists of what continued from the past. So traditions are valued. But the openness at the other hand is in this sense understood as the ability of the tradition and the conventional mind with it to be personally and collectively of self-criticism and of reform. Without the purification theme of this respect there is no progress possible and thus no chance to curb the unrighteous excesses that any system will give as a result of civil attachments. In sum is this duality of conventionality and openness in a personality overcome by a reform minded tradition, which is just another way of describing the actual tenets of filognostic progressivity: it concerns an adaptation of the sixfold philosophy of India to christian, gnostic insights, to an islamic respect for the natural order and to a chinese/japanese reflective attitude in the philosophical traditions of (zen)buddhism, shintoism, confucianism and taoism. The filognostic approach is rather methodic and analytic but curbs the downside of it by a proper sense of logic and causality. All intelligence is structure minded, whether it is in meditation turned away from or in a material vision engaged with it. Meditation only works properly performed according a certain plan. Also is illusion difficult to curb without any precision or exactitude (see e.g. the Tempometer). Nevertheless is clearly understood that bound to the false order of a culture that is turned away from the natural order in respect of the lawfullness of time, the ether (space) and matter, there is inevitably a false concept of order, punctuality and correctitude and a difficulty of arriving at integration. This negative falsehood of the cultural personality that strayed away from the natural order and science of uniting within (yoga) is simply considered square and a bourgeois attachment of fake temporal happiness. Thus the ideal integrity of the personality comprises precision, but it is qualified by a sound an non-illusioned respect for the natural order as it is and the person, not the way things are created by human action or experienced in psychically being troubled. Friendliness consists of the love to be human and is the positive value characterizing a healthy personality. The cultured person though is in constant trouble because of an authority conflict beween the culture and nature. Thus is the person individually and collectively chronically neurotic in his ineffectiveness of doubting who he/she would be and what or whom he/she should serve. Thus is the mature clarity of self-reflection in the psyche disturbed and is it difficult to find respect for classical teachings and teachers. Because of this conflict is all energy available for being a person of a better quality occupied, there is no synergy then nor social integration. The personality is thus not able to be friendly, of goodness, to be easygoing, or to be of reason and compassion. In other words the culture exhausts loosing synergy and all people are more or less squeezed out of its demanding soulless institutions. From this disturbance of having a bad (standard) time misses the personality the ability to contact others and be outgoing, stable, open minded and naturally correct as was clarified in discussing the previous four dualities. Therefore lacks the person in integrity, is the healthy ego corrupted in being turned away from spirit and soul, and is the intelligence fallen and bewildered. The personality gets thus finally twisted in a diseased and estranged state, or is otherwise compromised with crime and other individual and collective derailments. Conclusion is that the integrity of a personality depends on the ability to keep the human values in check in a properly, that is a naturally timed control over all the fields of action. While religiously the person is idealized in the example of the Supreme Personality of a godhead, prophet, philosopher or Lord incarnate, is the politicized society at the other hand, with a lack of synergy being of a fallen state of moral decay, corrupting, by its institutional control, the proper balance of a natural division of time. The normal personality is thus compromised lacking the respect it needs in the different fields. But a naturally healthy personality of filognosy is, equanimous and balanced, of an emotionally stable extraversion that is reform minded with the tradition with a moderate exactitude with the natural order of time so that there is enough synergy to be friendly and sympathetic for a pleasant human society of righteous and happy citizens. Rasa - healthy emotions with the mind of reform. Svarûpa - the essential character of service according the vedic order.